Two doors away in a house we once saw on fire lives a neighbour we have known for a few years and gradually appreciating how interesting he is. By the way he didn't learn about the fire until after he moved in. We learned soon that he was a paramedic who commutes to Oakville. The paramedic part came in handy a few months back when my wife slipped and broke her wrist. At first she didn't think there was a problem, but a few hours later showed it to Glen who urged her get to emergency. He didn't stop there, but showed up himself to make sure we followed his advice. Then he explained a lot of details to prepare us what to expect. Like us he has a pond in his back yard, but his is a little more elaborate. He gave us some water plants, but didn't realize that little fish were included. We had had fish a few years back, but gave up when raccoons decided to feast on them. These new fish were very tiny (and that might have saved them), but did grow to a visible size. We drained our shallow pond and ended up giving back the fish as Glen was more prepared for the cold winters. He invited us over for some family gatherings with his mother (who is very sharp), his two sisters and a cousin with their spouses. Always an enjoyable time as Glen is also a good cook. Speaking of cooking he once tried to duplicate a recipe from a restaurant meal he had enjoyed in the Bahamas, but felt he was missing something. For many of us we might have given up or try a Google search, but Glen made a phone call to the Bahamas. Fennel turned out to be the missing ingredient. One of his sisters invited us to a family gathering out in rural area where they also boarded dogs. She had met her husband Brian in Saudi Arabia where he was a former British police offiicr in charge of security for the Saudi Royal family and she was a nurse. We learned that the family had all lived in Montreal at one time and still retained some friends from there. Glen has done volunteer work in both Haiti and Guatemala. His sister Joan sometimes joins him. At his surprise birthday celebration I met some other volunteers, some of whom worked with him in Halton and another, a dermatologist. Economics can be awfully boring and I admit it was a struggle to get through "Keynes, the Return of The Master." I wanted to understand his message a little better and perhaps succeeded. You may not have heard of Keynes as in some circles he is very much out of favour. But after the Great Depression his ideas were heralded as the solutions to handle future depressions. He is dismissed by conservative thinkers who now seem to have the bigger stage. Keynes is criticized as the guy who wants to increase spending during a depression or recession even to the point of a deficit. Those who think that is terrible (and some of them seem to be in control) say that it is far better to cut expenses. They overlook that his theory includes the idea that governments should run surpluses when times are good and then spend when it is needed for the very slow times that otherwise result in unemployment. In fact he thinks that running a surplus keeps growth from getting out of control when it could precipitate a crisis. I discovered that underlying his mathematical and psychological thinking is a different kind of philosophy than one hears much of these days. The purpose of economics is not to make finances more efficient. Keynes feels that the only purpose is so that people could live "wisely, agreeably and well." He didn't restrict that to the rich, but felt income inequality was part of the problem. One of his most famous quotes is "..in the long run we are all dead." As ordinary citizens we hear a lot about how important it is to protect the job creators, but in truth we are all job creators. Meeting our needs and wants is what gives someone else a purpose (and an income). We in turn use our talents and energies to meet other people's needs and wants. Governments are not the problem as was famously said by Ronald Reagan, but they can facilitate the solutions. The author recounts history noting that governments swing from conservative to liberal and back to conservative. The problem is that society goes too far in one direction creating a crisis that causes a swing in the opposite direction. One of the problems comes from a political context. Rich people are at bottom interested in protecting and expanding their wealth and power. A philosophy that justifies what they want to do to benefit themselves is just another tool. With their wealth comes power that can be leveraged to attain their goals. The author, Robert Skidelsky has written a lot of books on economics including a much more substantial book on John Maynard Keynes. This one is struggle enough, but it is fairly current covering events up to 2009. He recognizes that Keynes had his limitation, lived in a different era, but that his wisdom still shines and should be heeded. This is being written with a different motive. Instead of my usual vanity, I am writing for myself as an effort to remember some interesting things. As you age you realize that one thing that nobody can take away from you are your memories. Naturally I prefer the pleasant things, but I also realize that memory is one of the things that slips away, thus stealing some your most precious things. Robert Sawyer spoke last Thursdayt at the Hamilton Library and a key theme for him was memory. He said a lot of little things that had a sort of profundity about them and I fear forgetting them. Writing his most recently published novel, Triggers he started with the theme of memory, before developing a plot or characters. He wanted to explore that. He pointed out that we don't remember in a scroll, but rather in little bits (not his word) that we re-assemble by filling in the blank spots. A questioner asked for advice for beginner writers. He started off by saying what not to do. Don't write about what you know--that will interest you more than your readers. Write about what you would enjoy researching. He pointed that many successful writers spent most of their time researching--best to find something you think would interest the general public and find out things they might not know. In reflecting on myself I actually do enjoy research and in one project I got to do quite a bit of it. Unfortunately it didn't work out, but I understand the thought. For these blogs I have written about what interests me so my audience is limited to those who would care about what makes me who I am and those who are interested in a particular topic. Not too many for the former, but possibly more for the latter on a good day. Having written 21 books Robert can look back at his career and see patterns and appreciate some of his luck. One pattern is that there is not much action in his books. This was made clear when one of his books "Flash Forward" was made into a tv series. Although he was consulted on every tv episode he found himself being pressured into adding action such as explosions. He didn't resent that as he pointed out the producers were investing $100 million in the venture and wanted to protect their investment. He read an 8 minute segment of his new book making the point that it was internal thinking. He was a very dramatic reader. It held our attention with its philosophical and psychological wanderings. Talking about characters, he doesn't believe in locking himself into a character description at the beginning. As the plot flows the character can go in different directions. He feels this is more natural and easier. Getting back to research he recounted a trip to Washington. A key part of the plot is an assassination attempt on the American president. He got tremendous co-operation from the CIA and medical staff at George Washington Hospital where protocol dicates an injured president would be taken. He was quite impressed with how helpful the staff was. After writing his draft Robert sent it down for them to preview. They assured he got every detail right except there were no drug addicted nurses. He doubted that as he was aware that it was a common problem in hospitals. However he thought about it and didn't want to offend those who had been so helpful to him and decided to make up a fake name for the hospital. He prides himself on using the real names of institutions (many Canadian sites are named in his novels), but saw this as an opportunity. He chose the name of Leroy E Burey. Before repeating the name of the hospital he pointed out he wanted to honour the man who had saved more lives than anyone else in the world. He further pointed out that unlike today this man resisted lobbyists and threats. He not only published a study that established the link between smoking and cancer he also forced tobacco companies to reference it on every package they sold. His experience with the tv series pointed out a few things. American broadcasters would not accept a European location as American viewers would not be interested in. In fact he said basically they were only interested in four locations--New York, Los Angeles, Chicago and Boston. A lot of truth, but I think that is breaking down. In assessing his own success he pointed out he made a decision that he was advised against. He set his stories in Canada. He found that wasn't such a handicap. He sells about as good as his Canadian collegues in the American market, but also sells a bigger share in Canada. This decision could have worked against him, but in fact it worked to his benefit. I had read two of his trilogies and like many found myself compelled forward to the next book in the set. He said he will never do that again. He gets bored. Publishers like them because they are easier to sell--at least the second and third in the series. But he prefers a stand alone book where he can study a subject in depth and then move on without obligation. He said the book he felt most satisfied with was "Factory of Humanity," even though it was not one of his best sellers or most acclaimed works. One women in the audience told him that she chose to study philosophy at university because of some of his philosophical thoughts in his books. He mentioned that he didn't have any connections to Hamilton, but a few years back McMaster University had pursued him to get his papers for their archives. Although he had been pursued by other universities he chose them because they thought of him for literature not specifically science fiction. He was also impressed that McMaster already had archives of Bertrand Russel, Pierre Berton and some of H G Wells. In an earlier blog, http://www.therealjohndavidson.com/2011/09/conversion-can-sneak-up-on-you-too.htmlI wrote about how Barry Finn, my boss at The Rider had converted me to an interest in science fiction. Robert J. Sawyer was a big part of that. He was probably the best I could have read. Author Rachel Herz was interviewed on NPR and intrigued me. Humans fancy we are conscious of everything important, but don't understand that evolution has armed us with many subconscious tools that help us survive. We are both genetically and culturally programmed to avoid certain foods and certain conditions often with physical expressions of disgust overlaying strong emotion. 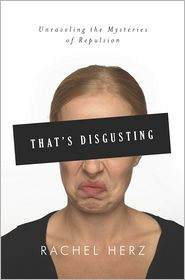 The author tells us that disgust is the newest of 6 basic emotions and is an extension of fear. She is not sure if other animals share this emotion with us, but suggests perhaps elephants might. That idea is based on the fact that elephants have an awareness of their own mortality. Fear of mortality is a basic requirement of disgust. Disgust helps protect us against rotting food at its simplest. Smells, mold and appearances of scabs can set off a disgust reaction. We avoid signs of spoiled food or ill living creatures. Many humans would react to someone vomiting by vomiting themselves. This could help purge some infection that got into some communal food. Disgust has gone beyond what we eat and can include more of our environment. We detest strange things as we often fear them. This can be people of a lower class or of a different culture/race. This disgust has taught us to be wary of strangers. The author claims that disgust is the most egotistical emotion, by which I think she means we see ourselves as the standard for everything and the further someone is from our standard the more inferior and fearful they are. Disgust is partly genetic, but a lot of it is cultural. The author gives many examples of what one culture loves that another is disgusted with. Cheeses that are considered delicacies in some cultures are repulsive in others. Disgust with some food can be counter productive and the author cites insects. With an overpopulated world insects could provide more nutrition more cost effectively than typical farm animals. Some cultures accept this idea, but most of us do not. She makes some political observations. Liberals are primarily concerned with not hurting others and being fair. Conservatives give higher weight to purity, loyalty and respect. These traits are related to how disgust is felt and expressed. Rachel contrasts disgust with empathy. Being empathetic means we identify with the other person. Studies show that women are more empathetic than men, but they are also more disgust oriented. In general familiarity deepens our understanding and acceptance of strange things. Rachel has written another book inspired by our sense of smell, "The Scent of Desire" which I am putting on my list of books to read. We humans value sight, sound and touch more than smell, but in fact smell influences us and our animal cousins a great deal. Predicting the future is pretty dangerous. 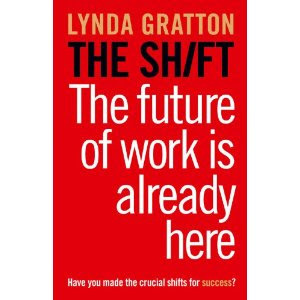 Lynda Gratton, the author of "The Shift" has tackled the challenge better than most. She identifies key forces (admitting they could be configured differently) and applies them to key questions. She then draws a range from the dark side to more positive. She maintains the dark side scenarios are more likely if we just let things continue, but that the brighter side can happen if humans intervene. The five forces are technology, globalization, demographics and longevity, society and natural resources. The trends within these forces will direct the future and to some extent we can shape them and with better understanding predict a more accurate (and better) future. To make her points she describes different fictional people in different parts of the world and how the five forces have shaped them. We will live in an globalized world but also fragmented. Technology lets us do more things that we once only imagined, but more of us are isolated and many decisions are based on the very high cost of energy. Ironically transparency has caused us to trust politicians and business even less, but at the same time living our lives guided by corporate agendas even more. A brighter future is possible if people work towards it. To survive in the future individuals will need to master a marketable skill. The author gives some guidelines to achieve that including of course lots of time devoted to it, but also to find an element of play. She suggests an individual develop a (figurative) signature that identifies them as unique. Unfortunately no skill can guarantee a positive future so individuals also have to have the flexibility to develop and master new skills. Technology will likely continue to change with unpredictable effects. It is also true that globalization ensures that competition will be pervasive. A second shift is necessary. In a world of dispersed families and impersonal work places it will become important to build social networks. One network is of close friends that can be counted on to support you. A bigger network of experts that can help you with problems of work and leisure. Although much of this can encompass social media it is most important you need to have a feeling of a physical community. A third shift is aimed to make it all meaningful. We have lived in a consumer oriented society. A quote that encapsulates her meaning comes from Robert Reich, "It is time for a longer discussion about what combination of economic dynamism and social tranquility we want for ourselves, our families and our society and about the public choices we need to make in order to achieve this balance." In summary Lynda seems to be saying that the five forces she has identified are key to understanding the direction of the future and indicate where an individual should examine future options, both as an individual and as a member of society. These five forces are not static, some parts are beyond our control, but others that can be shaped by thoughtful humans. It takes a lot of effort to develop habits. There are so many distractions. You all know that. I am partly continuing this progress report as an incentive to keep going. I have managed to do some pushups or situps every day and am ahead of where I originally intended to be. On my holidays I continued and if anything did more walking. But I have fallen behind in the progression laid out partly because of holidays and partly because I pulled an abdominal muscle. Seem to be going in the right direction. Work habits are also going in the right way and should progress as a new project is coming on board and one unexpected one was thrown my way recently, but will be wrapped up soon. Still got my foot in the door for mindful eating, but not progressing. If I don't report next anniversary month it may just as likely to be because I don't need to as I have given up. Thank you for reading this far--it all helps. I apologize to all of those who visited New York, before I did. There is not much new for you. For me it was a totally unexpected opportunity to learn a bit about all the fuss. My employer OKD decided to celebrate a good year with their staff. 29 of us joined together. Some of us had been there before (thank goodness for Suzy who helped guide us through the subway system) and a few rookies like myself. 1. I am a country bumpkin. Everything is so big in New York--there is a lot of flash and lot of diversity. Actually there is a lot of everything. taxis. You need them because no sane person would drive a car and the subway system can be confusing til you catch on..
3. Lots of things to do. Better to plan ahead, but also be prepared for new opportunities. 1. Central Park. It is bigger and more varied than I clued into watching it in movies. Owning property that overlooks Central Park is the height of luxury. 2. Top of the Rock was a bit scary, but helps to appreciate just how big the Big Apple really is. 3. Staten Island Ferry which also takes you to Ellis Island. Had a little extra personal meaning for me as my wife's Grandmother, Nanny came through there. My nephew Nicholas and his dad, Len Olynyk were able to find some of the records. 4. American Museum of Natural History has more things to look at than you have time, but most of it is very interesting when you examine it more closely. 5. Macy's put on an exhibition of Brazilian flowers that was more delectable than the photos I was able to take. It was beautifully enhanced with soft Brazilian music. 6. Architecture is everywhere. My guess is that the most talented architects were lured to New York if they weren't already attracted to it. 7. Restaurants. Unfortunately I only got to eat at a few. I think my favorite was La Mela, an Italian ristorante with an eight course meal that really made me feel good I married into an Italian family. Schillers was an excellent restaurant that was pretty noisy because it attracted a sociable crowd where I got to try a little higher end wine than usual. I visited Ben's where we had a genuine kosher corned beef sandwich. I enjoyed a Curry Hut meal that delivered a lot of value. Also bought two hot dogs from a street vendor that was more than satisfying. Walking by dozens of restaurants that were very tempting, but I have only so much money, so much time and so much stomach. They are nice people and they are also very interesting. One of the generalities is that most of them like to drink, but no need to go into details. A great group to celebrate with.